Save between 10% and 28% on the retail price of the individual products when bought as one of our great value Combos. The larger the Combo, the more you save. No code necessary, the Combos are already discounted. All SFD Combos come with the online streaming version of most DVDs that are included in each Combo as well as the physical DVD. The 'Thank you' email that we will personally send to you will detail the relevant 100% discount code(s) for viewing your DVD online. Don't forget to use Discount Coupon Code LDDISCOUNT in the shopping cart to get a 10% discount on the Line Drafter when bought with any Combo. A great combination to get started with the Dress Kit and 10% discount compared to buying items separately. Essential elements and more for getting started with the Pants Kit and a 10% discount compared to buying items separately. 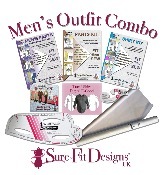 Create fabulous shirts with this great value Combo elements and a 10% discount compared to buying items separately. Essential elements and more for making men's trousers and a 10% discount compared to buying items separately. Essential elements and more for making men's trousers; shirts, and tops and a 15% discount compared to buying items separately. Create a complete wardrobe with these 3 kits in one combo with loads of extras and a 15% discount compared to buying items separately. Make clothes for the entire family with this packed Combo and get a massive 20% discount . This great Combo has all the items in the Works Combo plus 6 more complete lessons on DVD and has a generous 28% discount. 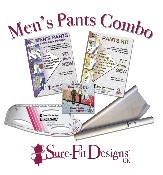 This great Combo has all the items in the Works Combo Plus and includes the Make It Sew set with a more than a 28% discount . All the tools in one great value discounted Combo.